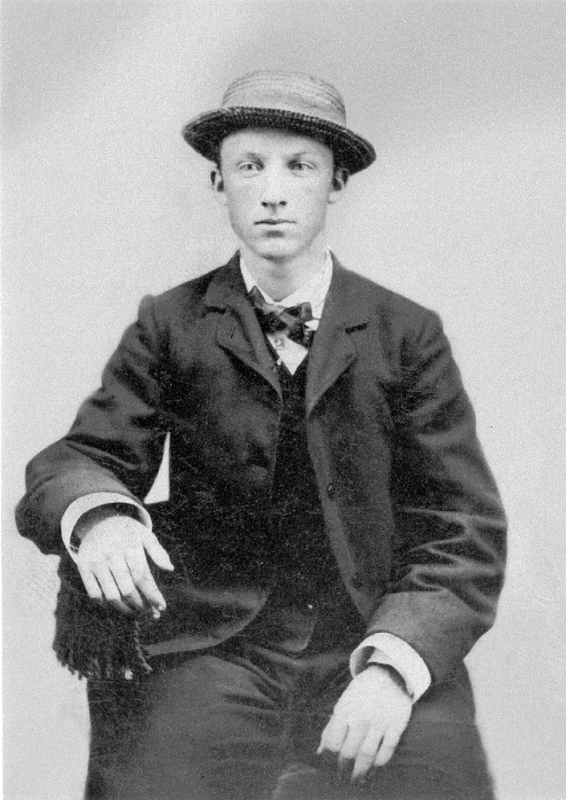 James Grant Older was born March 14, 1864, in Mechanicsburg, Illinois, the son of Samuel Clarence Older and Jane Eliza Baird. (1) James apparently was given his middle name after Union General Ulysses S. Grant. Anna Rosebelle Older was the only sister of James Grant Older. She was born July 26, 1862, and died February 28, 1942. She married John H. Butner on February 27, 1883. (2) His father was A. F. Butner and his mother was A. Haley. James Older is listed in the 1889 Danville, Illinois Directory as living in Germantown (Danville Post Office), Illinois. His occupation was that of a painter and he worked at the Chicago & Eastern Illinois (C&EI) railroad shops. (5) James Grant and Wilhelmina Fredericka (Lorenz) Older were the parents of three children, Roy Burton Older, Nellie Pearl Older, and Maybelle Older. Nellie Pearl married Frank W. O'Rourke on August 23, 1919. He was born December 23, 1890, and died April 3, 1963, in Dearborn, Michigan. Frank at one time was a Vice-President of Auditing for the Wabash Railroad Company in Detroit, Michigan. Nellie Pearl (Older) O'Rourke died October 9, 1885, in Danville, Illinois. Frank and Nelle O'Rourke did not have any children. They are buried in Springhill Cemetery in Danville, Illinois. Truxton James Older, a grandson of James and Minnie Older, lived with Frank and Nelle O'Rourke in Detroit for a few years, probably beginning about 1929. Maybelle Older married Cody Holmes on October 28, 1919, in Springfield, Illinois. Cody was born August 18, 1892, in Decatur, Illinois, and died April 24, 1988, in Decatur, Illinois. He was buried in Monticello, Illinois. Maybelle died May 20, 1959. Cody and Maybelle (Older) Holmes had two daughters, Lorraine Holmes who was born March 20, 1921, in Decatur, Illinois, and Jeanette Holmes, who was born January 16, 1929. Lorraine married William H. Dalton on April 20, 1947. A son of William and Lorraine Dalton, Phillip, died in the 1950s at about age 10. Jeanette married Robert Findley on June 1, 1952. They had no children. The father of Cody Holmes was said to have been a close friend of Buffalo Bill Cody. 1) State of Illinois Medical Certificate of Death for Roy Burton Older, registration district #92.0, registered number 347, date of birth February 10, 1886, date of death April 13, 1964, Danville, Illinois, father's full name James Grant Older, mother's full maiden name Minnie Lorenz, signed by Truxton J. Older, son, informant. 2) Illinois Marriage Records, James Grant Older and Minnie F. Lorenz, married May 21, 1885, in Danville, Vermilion County, Illinois. Volume V, Vermilion County, IL, Marriages, Vermilion County Court Records, Film #1298746:1298749. 3) Original data: Danville, IL, 1890. Danville, IL, USA: Norvell & Graham, 1890; Danville, Illinois Directory, 1889 [database on-line]. Provo, UT, USA: The Generations Network, Inc., 2000. James Older is listed in the 1889 Danville, Illinois Directory as living in Germantown (Danville Post Office), Illinois. His occupation was that of a painter and he worked at the Chicago & Eastern Illinois (C&EI) railroad shops. 4) James Grant Older and his wife Wilhelmina Frederika Lorenz are buried together at Springhill Cemetery in Danville, Illinois, next to Roy Burton Older and his wife Ethel Leona Worth. Also buried nearby are Nelle (Older) O’Rourke and Frank O’Rourke. Springhill Cemetery records, Danville, Vermilion County, Illinois, Lot 362, Block 21. 5) Obituary for Wilhelmina Lorenz Older, Danville Commercial News newspaper obituaries, April 28, 1965. Lists her husband as James G. Older, a son Roy, and a daughter, Mrs. Mabel Holmes. 6) James G. Older, Minnie, Roy, Nellie, Maybelle, and James' mother Eliza (Baird) (Older) Wire are listed in the 1900 U. S. Census for Indiana, Vigo County, Terre Haute, Harrison Township, Ward #8, enumerated June 2, 1900, house number 1658, dwelling number 51, and family number 52. 7) 1910 U. S. Census for Illinois, Macon County, city of Decatur, Decatur Township, Ward #6, enumerated April 21, 1910, enumeration district #117, Sheet 10 A, house number 1657, dwelling number 226, and family number 271. States that three children are all living. Nellie age 21 and Mabel age 17 are still in the household. 8) 1930 U. S. Census for Michigan, Wayne County, Part of Precinct 32, Township - Detroit, enumerated April 11, 1930, Roll T626_1049, Page 17A, Image 0824, Baxter Blvd., House 9125, Dwelling Number 2, Family Number 3. Lists James G. Older, Minnie Older, Frank O’Rourke, Nell O’Rourke, and Truxton J. Older living in the household. Truxton J. Older was a son of Roy Burton Older and James Grant Older and Wilhelmina Frederika Lorenz were his grandparents. 9) There probably is an obituary for James Grant Older in the Danville Commercial News shortly after March 31, 1946, his date of death. 10) There should be a Death Certificate for James Grant Older, either in Detroit or Dearborn, Michigan, or possibly in Danville, Illinois. 2. Illinois Marriage Records, John N. Butner and Rosabelle Older, married February 27, 1883, in Vermilion County, Illinois. 3. Illinois Marriage Records, James Grant Older and Minnie F. Lorenz, married May 21, 1885, in Danville, Vermilion County, Illinois. Volume V, Vermilion County, IL, Marriages, Vermilion County Court Records, Film #1298746:1298749. 4. Illinois Marriage Records, James Grant Older and Minnie F. Lorenz, married May 21, 1885, in Danville, Vermilion County, Illinois. Volume V, Vermilion County, IL, Marriages, Vermilion County Court Records, Film #1298746:1298749. 5. Original data: Danville, IL, 1890. Danville, IL, USA: Norvell & Graham, 1890; Danville, Illinois Directory, 1889 [database on-line]. Provo, UT, USA: The Generations Network, Inc., 2000. 6. Springhill Cemetery records, Danville, Vermilion County, Illinois, Lot 362, Block 21. 7. Springhill Cemetery records, Danville, Vermilion County, Illinois, Lot 362, Block 21; obituary for Minnie Lorenz Older, Danville Commercial News newspaper obituaries, probably April 28, 1965, or within a week after that date. 8. 1870 Illinois Federal Census, Danville Township, Vermilion County, enumerated July 4, 1870. 9. 1880 Illinois Federal Census, Village of Germantown, Vermilion County. 10. 1900 U. S. Census for Indiana, Vigo County, Terre Haute, Harrison Township, Ward #8, enumerated June 2, 1900, house number 1658, dwelling number 51, and family number 52. 11. 1910 U. S. Census for Illinois, Macon County, city of Decatur, Decatur Township, Ward #6, enumerated April 21, 1910, enumeration district #117, Sheet 10 A, house number 1657, dwelling number 226, and family number 271. 12. 1920 Michigan Federal Census, Wayne County, Detroit, enumerated the 14th and 15th of January 1920, enumeration district #72, family #343. 13. 1930 Michigan Federal Census, Wayne County, Detroit City, Ward 14, Block 145.